To Hammerfest on the "Ships starting with H" page. Source: Received from, and painted by, Jan Goedhart, Holland (see Post War details below). Built by Sun Shipbuilding Co., Chester, Pa (483), delivered in May-1945. Taken over in Chester on April 30-1945. One of 5 new ships transferred to Nortraship that year. The others were T/T Finnmark, D/S Lektor Garbo, D/S Carl Oftedal and T/T Honningsvaag, all included on this website - see this page. This ship had 2 Canadian, female radio operators. One of them was Yvonne Demers (from May 1945 till Jan.-1946) and the other was Margaret Dixon. 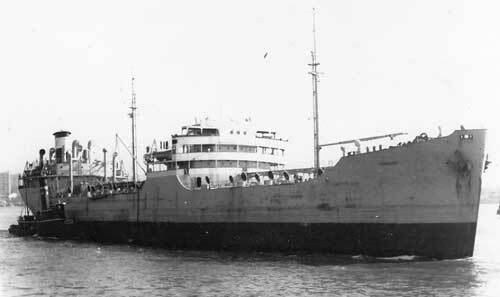 A list of names of other female, Canadian radio operators can be found on my page about M/S Mosdale. Probably via West Indies oil port. As mentioned above, Hammerfest was delivered in May-1945. Together with the Norwegian Notos and Ravnefjell, she's listed in Convoy NG 506, which left New York on May 6-1945 and arrived Guantanamo on the 13th (ref. external link provided within the above table). According to Page 1 of the archive documents, Hammerfest had started out in Philadelphia and was headed for Curacao, where she arrived on May 13, proceeding to New York on the 15th, with arrival May 20. A few days later we find her in the fast New York-U.K. Convoy CU 72, departing on May 25, arriving Liverpool on June 3; Hammerfest arrived Thameshaven on June 4. As will be seen when following the link, Karsten Wang and Kirkenes are also included. Later purchased by Johs. 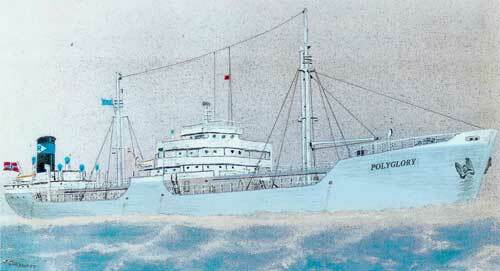 Hansens Tankrederi A/S, Oslo, named Polyglory in 1949, Union Glory in 1960. Back to Hammerfest on the "Ships starting with H" page.